« Noticeboard: EPA law suit interview today, Watts Up Tour starts tomorrow! In other words, just as you’d expect, the actual temperature of the whole planetary mass is not rising and falling within months, instead, at times the oceans swallow the heat on the surface and give up some “coldness”. At other times, the cold stays buried deep down and the heat can collect and loll about on the surface. William Kininmonth was chief of Australia‘s National Climate Centre at the Bureau of Meteorology from 1986 to 1998. Below, he describes how a vast pool of cold water filled the deep ocean abyss over 30 million years, and why this water and the currents that shift it have a major impact our climate. The so-called Bottom Layer is not just pockets or pools, it forms around Antarctica, then sinks and flows along the bottom all the way across the equator and into the Northern Hemisphere. Bear in mind the average depth of the ocean is around 4 kilometers, and yet almost all the water below a depth of 1000 m is around 4°C or colder. The Antarctic Bottom Water itself is close to 0°C. The equivalent heat energy of the entire atmosphere is stored in just the top few meters of water. It gives us all some perspective on the relative importance of different factors affecting the climate. His thoughts are in response to the latest debate essay from Dr Andrew Glikson, so the figures 1 and 2 come from that article. Kininmonth points out that small changes in the rate of the Thermohaline Circulation (also known as the Ocean’s Conveyor Belt) makes a huge difference to all corners of the globe, and that the climate models make large assumptions about the flow of energy. Since the cold bottom layer was created by a kind of “Antarctic Refridgerator” (set into play by the circumpolar current) this colossal cold pool of water will presumably hang around until the continents shift. That’s quite a few election cycles. Of particular interest to me was the second panel of his Figure 1(see below). It shows that the temperature of the deep ocean fell from 12°C to 0°C , but without explanation. Bob Foster has spoken of this regularly – the opening of Drake Passage and the isolation of the Antarctic continent from the warmer tropical surface temperatures by the Antarctic Circumpolar Current. This means that winter sea ice forms around the Antarctic coastline, and expels salt into the surrounding sea water which increases the salinity and density of the near freezing water under the sea ice. There is only one way for that cold saline water to go and that is down to form Bottom Water. The diagram identifies the commencement of cold Bottom Water as about 50 million years ago and near 0°C temperatures being achieved about 30 million years ago as permanent glaciation appeared over Antarctica. Gradually the cold Bottom Water filled the ocean abyss because it is thermally isolated from the energy supply at the surface. By 3 million years ago (see his Figure 6) the ocean below the mixed surface layer was filled with cold water and thereafter formation began to cool the surface temperature. Even today the cold ocean interior is being replenished as cold Bottom Water continues to form and the cold subsurface water is entrained or mixed into the surface mixed layer to regulate tropical surface temperatures. There is very little mixing of cold subsurface water under the western Pacific Warm Pool and surface temperatures are generally in the range of 30-31°C; over the eastern equatorial Pacific the rate of entrainment varies with upwelling and temperatures vary from as low as 22 °C (strong La Nina) to nearly 30 °C (El Nino). Figure 2 (see below) is also of interest. At winter time in the poles, more infrared radiation is emitted to space than the solar radiation absorbed during summer. So the high latitudes are regions of net radiation deficit. To maintain this condition requires continual transport of energy from the tropics by way of the ocean and atmospheric circulations. Trenberth and Caron (J of Climate) have estimated that about 80% of the transport is by the atmosphere and the remainder by the oceans. If this ratio were to vary then the climate would be very different over middle and high latitudes. For example, if the Thermohaline Circulation were to decline in intensity then there would be less transport by the oceans and the polar seas would become colder; at the same time there would be less mixing of cold subsurface water into the tropical mixed surface layer and the western Pacific Warm Pool would expand causing more energy exchange with the atmosphere and more poleward transport of energy to warm the high latitude land surfaces. Conversely, an increase in the Thermohaline Circulation would result in more warm water penetrating through the North Atlantic and Bering Seas to the Arctic Ocean but also more tropical upwelling of cold subsurface water, less energy exchange with the tropical atmosphere and cooler high latitude land surfaces as atmospheric transport declined. The atmosphere and oceans are interacting fluids and it would be naive to expect the partitioning of poleward energy transport between the atmosphere and ocean circulations to remain constant. Image Sources: Antarctic Currents Avsa. Small Globe in the first picture adapted from Oceania Maps. If you examine the nominal temperature profile of the ocean, there are 2 inflection points, one near the warm surface waters and another about 1km down at about 4C. The region between them is the thermocline. The temperature profile is consistent with the thermocline acting as a layer of insulation between the deep ocean cold and the warm surface waters. At northern and southern latitudes, the thermocline breaks through to the surface and at the N pole and around Antarctica, the deep ocean cold breaks through to the surface. The 2 poles and their corresponding ice packs are thermally connected through the deep ocean, i.e. isotherms at temperatures of between 0 and 4C connect the poles through the deep ocean. I like to think of the planet as storing energy in a similar way to energy storage in a capacitor. There is a cold plate (the deep ocean cold and polar ice caps) and a warm plate (the warm tropical surface waters) and a dielectric separating them (the thermocline). Energy is stored as a differential temperature between these plates and the average temperature of these 2 plates is the average temperature of the planet. This is more or less confirmed by noting that the temperature at the middle of thermocline is very close to the average surface temperature. There is a secondary boundary between the hot and cold pools of energy, which we observe as weather fronts and is where most of the energy transfer between these pools occurs. An important consideration is that energy is stored as equal and opposite amounts of hot energy and cold energy, each relative to the average temperature of the planet, which in a way offset each other. It also means that the ocean can respond quickly to changes in incident energy as only the boundary (inflection point) between the warm plate and the thermocline needs to change. The temperature at the lower inflection point seems fixed by pressure and density considerations. A very interesting post. One thing which strikes me very pointedly is the negative feedback implied. If ocean current heat transport declines then that directly leads to an increase in atmospheric heat transport and vice versa. Yet again, what we see in naturally stable systems is a dominance of negative feedback loops. This contrasts so strongly with the warmists who see posiive feedback in everything to do with climate. Without the claimed positive feedback there is no AGW crisis. Carl writes to tell me that he’s done a Danish Translation of this. Thanks Carl! This is why the artic thaws. It is floating solid ice and the antarctic is ice over land with no curents underneath. I appreciate the drawing showing the currents. It is not possible to really measure how much the volume is of the water movement. I have used “bubblers” in my yachtclub for 30 years. They stir the water and keep the water around boats left in the water frost free all winter. They give off no heat. The water under the surface is not frozen. Another good post Jo, thank you to Mr, William Kininmonth as well. Another “well understood” climate system I say. No doubt these currents are more active when the oceans are warmer. Another global “climate conditioner” at work every moment. The Warmists have always said “the effects of Co2 are well understood”. When you put this ocean information in front of them I’m certain they will either eschew it’s impact on temperature, or develop complicated formulae to “hide the effects”. Also naive to expect the solar cycles not to interact in more ways than just changes of solar irradiance. I am reminded of THIS theory — that the cold period after WWII (when the alarm of the day was “the coming ice age”) was triggered by depth charges and other explosives churning up the ocean to depths of many hundreds of feet and bringing cold, deep waters to the surface. If true, it means we have a ready method already at hand to cool the globe (assuming we ever need or want to). It would also be naive not to expect the sun and the oceans to interact in ways other than just solar irradiance changes. This looks interesting but i can only read the extract. It is sad to me, that Bill Kininmonth no longer works directly for the Australian government. It is sad to me also, there are no Bill Kininmonth’s working for the US government and instead we have people like Jim Hansen and Susan Solomon in positions of influence in the US government. We waste unconscionable time correcting for (or living with) Hansen’s and Solomon’s errors. Which all makes perfect sense of the near continuous near linear rise in CO2 being a slow dissolution/degassing from th southern ocean likely being a slow incremental rise resulting from the “thermal momentum” from the MWP? So if the average ocean depth is a couple kilometers, we have heat of millions of degrees very near water that is barely above freezing. Looks like we need more information. Interesting things are happening right now with sea surface temperatures. Click on the text below. then select “Sea Surface” from the drop down menu. HINTS: Tick the years then click “redraw”. Also drag the vertical line sideways while the left mouse button is down. It’s interesting nobody’s mentioned CO2 and ocean water temperature changes. As water warms, CO2 dissolved in it is released. The oceans contain enormous amounts of CO2. We should see CO2 concentrations rise and fall with La Ninas and El Nino’s. Another question: Fresh water is densest at 4 degrees C. Temperature in a lake will decrease until it hits 4 C then be 4 C all the way to the bottom because colder water is lighter and a circulation is maintained keeping the temp at 4C…provided, I suppose, that the bottom is a heat source. It’s hard to imagine the bottom of the ocean not being a heat source given that this is where the tectonic plates separate but I suppose we’ll have a number of surprises as we learn more about this. What happens in water with disolved salt? I know it freezes at lower temps than fresh and that a saturated solution of salt water freezes at 0 F or about -18C. Sea water is far from saturated…unless salt ice is forming (which happens at the surface) which forces salt from the ice until the ice is free of salt. When SCUBA diving north of Boston, we’d go down and hit the thermocline. That was about 40 feet down in summer. From there down it was darned cold but the same temp all the way down to the bottom (another 60 ft, for us.) And, what happens to water density and temperature with greatly increased pressure? The pressure at the leaking BP well head is about 2400 psi. That’s 5000 feet down. There’s been a problem with ice crystals forming…. Paul Kenyon is right, CO2 is more soluble in cold water, and when that cold water upwells and warms, the dissolved CO2 off gasses. This is the source of the majority of atmospheric CO2- how green is that? Mattb is that argument from authority at 12? If this guest poster is correct in his conclusions it definitely throws “cold water” all over the theory of CAGW because the deep oceans would be incapable of the “memory” assigned to them by the IPCC. In other words the “missing” and “latent” heat would be nonexistent. Where oh where has my missing heat gone, oh where, oh where can it be? The rhetorical answer to my rhetorical question is quite simple: the IPCC was wrong in its equations and assumptions and there was no “missing heat” to begin with! Excuse me but I am out of beer and it is time for a margarita! I will check with y’all later!!! I wonder how Rajendra Pachauri feels when he hears Lady Gaga’s “Bad Romance”? The “narrow” passage between Antarctica and South America can be sufficiently restricted by volcanic eruption to substantially alter either or both circumpolar currents. The region is volcanically active. Restricting the currents will cause more water to flow along the West coast of South America while reducing the flow through the “knot” of currents that cool the waters in the South Atlantic near the Weddell Sea. If such a change occurs; which in Flim-Flammery is possible ; then changes in climate will follow. People tend to fear any type of change. Perhaps they prefer to be scared, bored and unchallenged. And broke; trying to stop things from changing when they can’t be. At 33 degrees F. water will easily absorb Co2 The polar oceans are a constant sink for Co2. Mattb has implied that climate scientists (at early undergraduate level) fully understand the dynamics of ocean currents and thermodynamics, and can accurately calculate the total thermal mass of the oceans, together with the exchange rate to and from the atmosphere. I do not believe he (mattb) has the credentials to make those assertions. Eddy, Happy hour to you too! Mark, you are one of my favorite posters and no disrespect intended but I gotta ask you bro, “Are you f@#%@# kidding me?” I challenge you to cite the instance where my Mate MattB didn’t say he was comfortable resting on the ‘authority” of the IPCC and the rest of their climate conspirators unfounded BS? I have a love/hate relationship with Matt but I have long since given up on reasoning with him. The good news is that, according to Matt in a recent post, he will “come around” once the skeptic position becomes the “consensus” opinion (that should not be too long from now). The bad news is that life on this website will become a lot more boring for a lot of posters (including me) without Matt to argue with. Think about it, where would this website be without our favorite arch villain wannabe professional wrestler to tangle with? You got to give Matt credit as he does hang in there and in that sense he has the staying power of Zeus! Wow! I am defending MattB? Time for another margarita!!! Sorry about the typos but I am typing with one eye open to avoid seeing double. My brother (younger and therefore the fall guy) does not skimp on the tequila! Oh so he’s your mate now is he? Don’t worry dude, it’s you and me ’til the wheels fall off! I have my powder dry so when the wheels fall off (could be soon) I expect to be a popular date…. You always cease to amaze me Matt. If you knew half of what you pretend, you would be a legend in your own mind. I hope you’re not in the Australia time zone — you’re having way too much fun for the middle of the afternoon! I wish I could get drunk enough to believe in global warming! I would be such a hit with the crowd. Unfortunately, I know better. I see prescient post after intuitive, insightful post on Jo’s website and others such as Junkscience and Climate Depot and I cannot “get with the majority.” I suppose it is better to march to the beat of a different drummer than to be one of those souls without the gift discernment or a sense of self worth. Again, sorry for the typos! That damn brother of mine! Being merely a farmer I can only add that one should not swim in still water. A tank several metres deep on the hottest day contains warm water less than a metre deep. Under that it is cold, very cold.It seems waters natural state is cold. Should that be the case the oceans of our world will prevent the Earth from ever overheating. And not to talk myself up, but my undergraduate degree is from a department that specialises in water research, and included oceonography, and while it was 15 years ago, I can put my hand on my heart and say that there is nothing in the above post from Mr Kininmonth that is not firmly planted in mainstream oceaonography – other than the fuzzy conclusion that it has some relevance to whether CO2 can warm the planet. Lastly – Eddy – I’d love you to quote where I rely on the IPCC – I saw you quote one the other day but it was tongue firmly in cheek when I said it. George is spot on… It’s a damn good way to look at it. Matt B is correct at June 12th, 2010 at 11:18 am . Mr Kininmonth does not hold a doctorate and therefore cannot under any circumstances be classified as scientist irrespective of positions held or publications produced. He should therefore be ignored. A bit like Michael Faraday and Karl Weierstrass. It was post #12 when it was cocktail hour here. I am in good company as even Jo refers (in her new addendum) to George (Co2isnotevil) at post number 6 (he now is at #7). So somebody slipped an extra post in somewhere between #2 and #6. The numbers jumped when Sliggy was unfortunately picked up by the spam filter. When I set him free his post slotted in to the right spot – as he had submitted it. I’ll look into a way of making that approval process faster. Kininmonth has peer reviewed work in progress we are discussing that points to major holes in the models. “climate” without an oceanic perspective is like a car without the chassis. But then you’d know that right? Why is it that you frequently miss the point entirely. What this tells us is that the ocean is not a sluggish repository of thermal energy that is postponing the effects of man’s CO2 emissions. The warmists came up with this rationalization when the extraordinary surface temperature trends predicted by the IPCC failed to materialize. Of course, the real reason was that the natural warming trend that occurred during the 90′s and early 00′s, and which was misidentified as anthropogenic warming, was replaced with a natural cooling trend in the late 00′s. The warmists can’t admit that natural cooling can occur, because to do so would be a tacit acknowledgment that any effect of incremental CO2 is easily overcome by natural forces and this undermines the entire CAGW case. BTW, you haven’t answered by last question in a prior post. Where is your extraordinary evidence to support your extraordinary claim that the climate system is dominated by positive feedback? I know you can never deliver such proof, because it simply doesn’t exist. I’ve looked far and wide, but all I can find is proof that the climate system is dominated by negative feedback. I challenge you to try and prove me wrong. The only ‘evidence’ that positive feedback dominates is the flaky hockey stick graphs which imply that it must be that way for the graphs to be valid. Of course, we all should understand how well highly selective, heavily adjusted, inconsistently homogenized curve fit data is at representing reality. * The atmosphere CAN ONLY be warmed by the surface. * 70% of the surface is ocean. * Therefore the oceans need to warm up first before the atmosphere can warm. * The oceans ARE MAINLY warmed by direct sunlight, which penetrates to about 100 metres. The “well mixed” area of ocean. * Therefore cloud cover MAINLY governs how much oceans warm up. * CO2 radiation (long wave) can only penetrate the top one millimetre of the ocean. * Other than via natural mixing of this top one millimetre, CO2 has no effect on ocean warming. * Warm surface waters sit on the top like an oil slick. It is physically impossible for warm waters to penetrate below the ‘well mixed” layer. Therefore deep ocean will never warm up. * Therefore Trenberths “missing heat” cannot be in the deep oceans. He needs to find another ruse. * ONLY at the poles can surface water be colder than deep water. This is where surface water sinks to the deep, this is where the conveyor belt begins. So in essence, it is the SUN, the CLOUDS and the OCEANS stupid. CO2 comes a very distant last. Wiki is hardly an accurate source – But scientfically the properties inferred to occur in the mantle etc are deductions from prior guesses starting with the big bang, then the non observed solar accretion model, from which it is deduced that etc etc, then they discovered that the continents sort of fitted together and continental drift was proposed, then followed the discovery of the oceanic ridges and spreading zones, then seismic tomography showed that there were no subduction zones and that the mantle appeared to be a trilobed structure in terms of density etc. I would suggest one plot the earth’s “measured” temperature profile from the thermosphere down to the earth’s surface and then into the deeper bore holes. Then from that plot determine what the internal temperature of the Earth might be. The Russians drilled a deep hole into the Kola Peninsula decades ago, and made some interesting discoveries. 1. Geophysicists estimated the thermal gradient incorrectly – 50% error which is not surprising to me as an exploration geologist. 2. The seisimic layer they identified as dolerite/mafic at 6000m was actually water saturated gneiss. Nothing like empirical facts to get some real data. But the assumption of mantle geophysicis isn’t based on scientific observations but deductions from a belief of what happened previously, and that was based on creatio ex nihilo (the Big Bang theory is a liberal version of Creationism) occurring 13 billion years ago. We do not know what the internal mantle temperature of the Earth is, not do we know what the internal temperature of the sun is (The solar photosphere is 5000K, but the sunspots under it are ~3000K and cooler. On that basis extrapolating the solar core might be 100C. With your excellent analogy you chose one of two obvious storage devices. What do you think of this modification to your idea? Instead of the sea as just a capacitor the sea energy storage could also be compared to an inductor with your capacitance still existing like interwinding capacitance. The movement of the seas can then be compared to electron flow in the inductor. The conductors path is the thermohaline flow line(s.) So now with both a capacitor and an inductor as storage devices we have the inherently cyclic nature of a resonant tuned circuit. Which would passively respond to the solar cycles. There is inductance in the circuit and there are resonances. As the thermal mass of the thermocline (i.e not the entire ocean) is the capacitance that resists a change in temperature (voltage), the circulation currents in the atmosphere and ocean, including the thermohaline, forms the inductance that resists a change in energy flux (current). That is, the flow in these transports changes slow enough to resist rapid changes in the temperature difference between the pools driving the circulation. It seems that the typical resonant frequency is on the order of decades which we observe as local decade scale climate variability. My view of the planet’s climate system is that it’s comprised of many, largely discordant, resonances represented by many LC like nodes corresponding to the different ocean and atmospheric circulation zones. The complete circuit, by virtue of various equivalence theorems, can be considered as simplified, equivalent circuits, at least to the extent that model time step is large enough (on the order of weeks), that small scale weather variability will more or less average away. BTW, the capacitance is really a little more complicated. It’s simplified equivalent is the volume of space and what it contains between 2 isotherms whose temperatures are those of the inflection points in the thermocline temperature profile. These are roughly toroidal shaped, concentric surfaces surrounding the equator. They are complete surfaces that pass through the lower ocean and upper atmosphere where the pool of cold completely surrounds the pool of warm. Another isotherm of significance is the one at 0C, which represents the average extent of the glacial ice pack. In the same way that Gaussian surfaces are are important to Gauss’s law, it’s significant that across the planet as a whole. surfaces of constant temperature do exist as long as these surfaces are free to pass through the atmosphere, oceans and surface. The only ‘isolated’ regions of warm or cold thermal energy are generally caused by altitude differences and/or local temperature inversions and are relatively small. Taking advantage of these isotherms can dramatically simplify calculations and facilitates accurate results without the requirement of accurately modeling the chaos. Yes oceans affect the atmospheric and surface temps, we know that. But it doesn’t explain the longer trend upwards in the surface temp data. This is a magnificent thread. Stuff I’ve never seen before. This too has to be part of the answer behind the mystery of the way atmospheric CO2-levels soar then free-fall. Of course the monopolized CO2 figures do not show the CO2-levels soaring and dropping. They only show a steady increase. The idea of an audit of these clowns is overdue. But then it could be that the oceanic stratification has mostly stayed in place these last few decades, due to the oceans being “in summer” as it were. I’ll explain what I mean by OCEANS IN SUMMER below. There would be two reasons for soaring and falling CO2 levels. And that would be 1. soaring and falling undersea volcanic activity. 2. Disturbances in the stratifications in the ocean. Neither of these has been looked into in a very serious way it seems. Or if they have they haven’t been related to the CO2 record to try and explain that record. In the Great lakes you get this strong stratification in the summer. And you get this overturning and temporary homogenization of the lakes water, in the Autumn. One wonders if prolonged weak solar activity will lead to the ocean apeing the lakes in a like way. Leading to a serious partial-homogenization of strata in many areas, which may cause CO2-levels to at first soar, and then to drop dangerously. Lets hope if such an hypothesis turns out to be correct, that we will have a massively powerful hydrocarbon industry, working full blast, the next time that CO2 levels are set to free-fall. I like this thread particularly because it at least seems to confirm my prejudices. The prejudice that I’ve had for a long time that climate is not so much about watts-per-square-metre. But rather that climate is about strata-and-heat-budgets. Is anyone else here aware of Dilley’s works regarding lunar influences upon tidal cycles? and annual polar melt water sinking inputs. they have to, as they have 800 to 900 times the heat capacity of the atmosphere. run a cold bath, you have a cold bathroom. Regardless of the CO2 level…..
1. Its not alright to use rigged data John. Goddard data is unacceptable. 2. We don’t expect one constituent part of the puzzle to explain the jigsaw entire. 3. A good deal of the rest of the puzzle is explained by solar activity. Not just electromagnetic activity either. But electrical activity added to that, in the form of solar winds and Birkeland currents. So, 15 years ago climate models had oceanic currents and phases, and their effects nailed. ???????????????????? WHAT was first discovered in 1997, 13 years ago. PDO’s. BTW Carl Wunsch would not agree with you at all. Today he says we still have no real idea of lunar influences upon oceanic currents and phases. “Is anyone else here aware of Dilley’s works regarding lunar influences upon tidal cycles? I know Piers Corban places a great deal of emphasis on the moon in his unsurpassed weather forecasts. I know that Jennifer Marohasy featured a fellow talking about the moons influence on her blog. Don’t know if it was Dilley. I would think the moons influence was mightily important. It could impede or help the great ocean conveyor at many points. It could be having all sorts of effects. The Pope and Kevin Rudd Prime Minister of Australia are on the same stage in front of a huge crowd at the AFL Grand Final. So the Pope backhanded the Dudd! that dissappear and reappear for no apparent reason at present. What is your point here Matt? 1. That you will diss someone who crosses the global warming fraud, regardless whether his work is mainstream or innovative? 2. That the quality of undergraduate degrees in the natural sciences had already been watered down by 15 years ago? I don’t know Matt. What’s your point? You tell me I don’t know. Not enough beer in the world Eddy. You’d die first. And the scientific lesson we get from drinking is that you must have to get awfully sick before you die. How is that business getting along Eddy? The one in the industry that the rest of us sinners all rely on? There ought to be serious work to be cut out, if someone was able to relate Dilleys work to Corban’s concrete predictions. From that combo, one ought to be able to improve the theory and then turn around and further improve the practice. Since Piers breaks the state of the climate into solar/lunar snapshots. When he has a prediction for solar activity and lunar movement, he then sees if he has data on a previously similar scenario, and constructs his predictions from that. So thats a lot of good data for a theoritician to work with, supposing he had Corban’s enthusiastic co-operation in the project. Stop calling alarmists climate scientists. They are not scientists they are whores, idiots and deranged bedwetters. Always the basics are the most important thing. The more complex a problem is the more that intensely working through the implications of the basics in every area will bear fruit. I don’t doubt that you cannot grasp the application of our knowledge of the oceans to climate science. I never once doubted your lack of ability in the conceptual area. I am not aware that they know of each other, or communicate with each other. but the later part I suggest can not be ignored. Few seem to admit of it’s existence, even when talking of lunar tidal influences. ? The chart you linked to is very interesting. The lower SST part shows a red peak at 2009, 11 years earlier at 1998 there is bigger one and 11 years earlier than that in 1987 another. Then go back another 11 years to 1976 and there is another red peak in SST. Back to 1965 and we have another red peak then back just a liitle more than 11 years another. So very eleven years = a peak in SST. Well the point is Derek IT WORKS. At least to the extent that empirically we know the moon has a powerful effect it works. So people ought to be casting around to people like Dilley to figure out why this is so. The moon will effect the oceans, the air pressure perhaps, and it may even effect earths magnetic field. In otherwords all the important stuff other than the suns activity itself. It is on the basis partly of where the moon is at, that Piers is making the call for serious cooling over the following two or three decades. We are furiously agreeing Graeme. BTW – Ignore / scratch my comment re the first part of the ebook. It has been totally rewritten since I first read it about 3 years ago now. The version linked to above is a far better explanation, and firming up of his works. Would an electric universe view help also with Corbyn and Dilley’s approaches. ? Indeed an electric universe would help both approaches. Since an electric universe would appear to be the leading paradigm. The leading paradigm is the closest thing to truth we have. So making the direct substitution; the truth helps with the truth. The truth helps itself. Untruthz only work in service for other untruthz. But the truth works in service for itself holistically. it is based upon NASA’s own lunar temperature readings. how much warmer the earth’s surface is than it would otherwise be without it. commonly described as about 33 degrees celcius for earth. However the moon with no atmosphere at all, apparently has an atmospheric “greenhouse effect” of about 40 degrees (Kelvin). the net result being a surface that is 40° warmer than predicted. I added the link in the post at the bottom. Further to my post 61.
as I have diagramatically tried to illustrate with the below linked to illustration. I’m not really sure what an early undergraduate level discussion of well established ocean current principles brings to the climate debate? Is the suggestion that climate scientists are unaware that there are oceans on the planet? I don’t see much understanding of the issues being discussed on this blog (especially this thread) in the pronouncements of “climate scientists”. Especially the fuzzy claim that heat must be going into the deep oceans (how, they can’t say) because they know (from their dedication to theory) that the Earth is absorbing more heat than it re-radiates. (Or, perhaps they know this because they are taking the difference between two large and poorly measured values and conveniently ignoring the near 100% uncertainty in the result, as long as it’s what they want to hear.) Their conviction that this is happening is so strong that they uniformly ignore the best measurement system of ocean heat content ever devised — the Argos float system (which reports the top mile of the oceans cooling down). If this shows that “climate scientists” are well aware of ocean dynamics, I would like you to explain why. I see a lot of wishful hand-waving. So, your claim here is that everything about the ocean’s influence on climate was known (and fully included in the GCM models — which strangely still can’t predict el Ninos/la Ninas) 15 years ago? Come on, MattB — an undergraduate education simply indoctrinates you with the currently popular prejudices, and yours is from 15 years ago, even. It isn’t the last word on any subject. Things that are well known for a long time can be understood in completely new ways, and it seems to me that the ideas on this thread can’t be dismissed so easily. If the deep, cold oceans really don’t have any effect on the Earth’s climate, pray tell us why — don’t wave out of date (and weak, anyway) qualifications and claim authority status. I have 15 granted patents in a field which has been taught to “undergraduates” for over 300 years (optics). Some of those inventions involve ideas that anyone could have had anytime in the last 3 centuries — but didn’t. Your conviction that ocean dynamics is completely understood by anybody (especially, “climate scientists”) is absurd. See how what you are saying in that diagram Derek. See how that manifests on Venus with the super-rotation of clouds. Hilarious. So the moons greenhouse effect is stronger than our own and it has next to no atmosphere. That-right-there is a devastating blow to stupidtown. Also it tends to reinforce my law of science. The one that says Louis Hissink is always more right than one at first imagines. Bear in mind that there will be conversion to thermal energy from energy sources other than electro-magnetic energy. You have the “cosmic ray” bombardment. The solar wind bombardment. These are both moving charged particles and moving charged particles are effectively an electric current. There is probable Birkeland currents. Then there will be tidal heating from the earth. On Io, tidal heating is enough to keep continuous volcanic activity happening. This of course means we have tidal heating, on earth, from the moon. If we think in terms of strata and heat budgets. The moon will be a factor that will upset strata. Like our fast rotation, as compared to conditions on Venus. On Venus the slow rotation, would mean stronger stratification, hence the ability of heat budgets to build. The various strata will not be as strong as they might be on earth, because of faster rotation and the moons actions, both. Then on the other hand the moon will be creating tidal warming directly. In other words, the moon, ought to have a pretty complicated effect on the climate. Both warming, and assissting in thermal transfer, up and down. Laterally as well, one supposes. Kind of crazy that quakademia doesn’t feel it needs to take the moon into account? They are just not that bright. But that news that the moons greenhouse effect appears to be stronger than our own, is a devastating elbow strike to be used in these various arguments we have all over the net. Where is the anomaly that greenhouse is meant to explain given what you are saying about the moon? Killer factoid. Thank you Graeme. It is good to know some read some of my comments. I am also an avid reader of Louis Hissink’s comments. Also thank you for making me realise something else obvious. and a volcanic eruption ensued. ? Is anyone aware of any studies comparing volcanic eruption starting times and lunar relative position. ? If so, please provide a link / reference. BobC: your post in 64 totally misrepresents my position and statements made on this thread. I have not claimed any authority in the slightest and your attempt to dismiss me in that manner speaks volumes. what kind of complete nutquackeryjob would claim that the oceans don;t have any impact on the earth’s climates. Unbeleiveable – I can only guess one of your patents is in bullshittery. At barely one step, that was THE logical implication of that smarmy statement you made, while sporting your alleged undergraduate degree credentials. Yes I never doubted your inability to apply fundamentals in one area to another area. And yes I don’t doubt the accuracy of your description of the persons that hold your constellation of views in the statement I’ve quoted of you above …….. either. It was an undergraduate degree involving partly water research and some oceanography do I have that right? It wasn’t an undergraduate degree in applied logic was it? No it wasn’t. No I didn’t THINKso. A volcanic eruption may be too much of an all-or-nothing thing on this planet. So I would look a step down the scale. And go to earth tremors. Then you could get a statistical correlation with low Richter-Scale earthquakes. If volcanic eruptions were held to be in whole or in part, electrical discharges, then it would be hard to separate the moons role in conveying, or impeding, electrical flows, and its role as a pure gravity pull-factor. A pure pull factor aggravation. I think you would have it right on this camel deal, and so that therefore we would expect some statistical increase, not so much in volcanic eruptions, but moreso in earthquake tremors. Being as it ought to be as you say. The moon ought to act as tie-breaker, when other forces are in the balance. Two fists pushing against eachother. And a relatively weaker third party makes them lose that balance of forces. Tidal effects on Io obviously massively increase its subsurface temperatures. Whereas if Venus had a moon it would probably disrupt its various strata, and therefore not allow for Venus’ surface-strata heat-budgets to be so massive. Further to that a sizeable moon of Venus would likely assisst more of Venus’ atmosphere to escape. I have formed the view that we must be losing atmosphere the whole time and that our atmosphere must be continually renewed. So someone who thinks along these lines would imagine that a moon of Venus may have stopped the air pressure of Venus from accumulating to quite the extent that it did. So I would conclude that on IO tidal warming is a net warming factor. On Venus, it would be a net cooling factor. How does our own moon effect us on a NET level? This I suspect is a hard thing to estimate. The only thing for sure is that the moon will be massively important to climate on a yearly and decadal basis. He has too many influences. Our girls are all married to the moon as well. So we ought to have known by now, not to underestimate his powers. Also: Your ability to guess is no better than your ability to reason — I recommend against you relying on either. At least I didn’t wager or I’d have owed Richard another few thousand bucks. But I read the post above and all I see is a fairly non-controversial discussion of ocean circulation followed by some ifs and buts and maybes as this relates to climate science. “The atmosphere and oceans are interacting fluids and it would be naive to expect the partitioning of poleward energy transport between the atmosphere and ocean circulations to remain constant.” To me is especially weak – in fact naive. It is a nothing statement. I’d like for starters to know which climate scientists “expect” this to be constant? The above post has no references so I can’t go and find out. MattB I almost gave you a thumbs up just for the word “Bullshitery”! Of course its related to climate science you idiot. What are you trying to do? Morph your way out of your stupid statements? Anyone can just scroll up to see your stupidity Matt. Give it a rest will you? Take it on the chin and attempt to do better next time. It would help if you gave away your idiotic CO2-bedwetting and just turned over a new leaf. You are less likely to make an idiot of yourself without all the religious committments. You have always been short on evidence for your stupidity. You should swear a blood oathe to yourself: either come up with your evidence or retract. We have raised an whole generation of poorly educated blockheads. The worst thing is they are people who don’t simply own up when they get it wrong. This is not science. Because science requires enormous amounts of speculation, and most of its going to turn out wrong. read again blockhead… I didn’t say it’s not related, I said ifs buts and maybes about how it relates to climate science. not “maybe it relates”. Don’t they have large screen font options for old geezers like you Birdy? How does our own moon effect us on a NET level? This I suspect is a hard thing to estimate. The only thing for sure is that the moon will be massively important to climate on a yearly and decadal basis. He has too many influences. Our girls are all married to the moon as well. So we ought to have known by now, not to underestimate his powers. Or just ignore them, as “they” do at present. Is this area an area where (some of the more open minded) climate skeptics, and the electric universe proponents could work well together. ? If it is already happening, can someone please point me in the right direction. this article suggests that the earth may be a electromagnetic coil transformer and shows a number of ways that there can be natural coils and wiring around the earth including in our atmosphere, oceans and the land. Considering the earth has a global electric weather system this idea has to be at least considered. the diagrams may not show things flowing the correct way as they are just examples of the idea. FYI the article was written by me. Interesting concepts discussed by Graeme and Derek WRT moon and tides. Huge masses of water are raised several meters every eight hours or so. What is the effect (work done?) on the underlying strata? I’ll take a bit of a punt at this below. But more generally, this I think, is the topic for research, rather than something that can be nutted out apriori. People seem to imagine that because expectations of apriori thinking are virtually always proved wrong, that this type of thinking is not useful. But such a prejudice against inductive thought (hardwired in by some silly ideas by Popper and others) misses the point of the scientific process. When the apriori findings are found to be wrong this is what can set up the clues to what is really going wrong. Which of course points out the utter failure of the “mainstream” with regards to their one-step apriorism to do with C02 warming. Instead of recognizing they had been wrong, and using this as the clue to follow, they simply put billions of dollars into spinning it that they were right. The politicization of the subject, and the too-much-money-too-soon thrown into it, has made the easy-going speculation that we see on this thread next to impossible. Take someone who has skin and ego invested in this subject. Lets say Peilke snr. Good scientist. But can he speculate in the easy-going way you see on this blog? No because if he says but one thing that he cannot prove, or that turns out to be wrong (as almost all apriori speculations do in some fashion) then Lambert and others will be on his case. They will take time out from Malaria-holocaust-denial and start dumping on his person. So the villains have not only closed their own minds to the scientific process. They have vastly inhibited the process on the other side of the street. Hence you will almost always get the best leads from non-specialists. From people outside of climate science. The main thing to consider with the moon, is that while it should have an effect on all strata, its effects ought to be more pronounced where the centre-of-gravity is, between the moon and earth. Whereas we say that the small body revolves round the more massive body, each actually revolve around a centre of gravity aka centre of mass. In the case of the Earth and the Sun the centre of gravity is outside both bodies and messed up as a working concept, by the existence of other planets. But in the case of the moon the centre of gravity is currently within the earth. “….. The Earth and Moon orbit about their common center of mass, which lies about 4,700 kilometres from Earth’s center (about three quarters of the Earth’s radius)……. Since this centre of mass is clearly far deeper than the deepest oceans, one would assume that, for our purposes, the moons pull is stronger, the deeper you go. And if the idea of this thread is right …. ie the cold deep oceans are a main driver of climate, then we would guess that here the moons effects are critical. Since they will exert a stronger pull on the deepest oceans. David Archibald showed up briefly at Jennifer Marohasy’s blog once. He said that he had been doing some research which implied that CO2 exchange in the top 100m or so of the ocean is currently pretty much in equilibrium. While we cannot trust NOAA’s CO2 compilations, still this could account for the steadily growing CO2 levels that they purport to show. But if you consider the massive undersea volcanic activity, we can expect that CO2 saturation could be vastly different strata to strata. When and if these strata are upset in some sort of massive way, we will have huge effects on climate and world agriculture. If we look at Becks CO2 record we notice that Western civilisation got very lucky after the Napoleonic wars. CO2 levels were extraordinarly high at the time that peace was made. Famines were rare despite the untold ravages of war. Also we were incredibly lucky after World War II with very high CO2 levels. Where Becks CO2 graph dives, it is not hard to find evidence of a tie-up with more extensive famines. We were not so lucky after World War I. The grim reaper followed with extreme prejudice. We need to be gearing up our hydrocarbon industries. To provide a lot more energy, for direct industrial needs but also to get nuclear in place. We need to be reforming the world of science, because we need a science academia which can furnish reliable answers, as opposed to the science-worker-quakademics, we are currently stuck with, who cannot. One imagines that he might rather have said : “that we can now explain by our solar-lunar magnetic-amplification process.” That would seem more coherent. When we are talking magnetic fields we are also talking electrical currents. Whether they be quasi-currents like the solar winds, and cosmic rays, or other flows, like with Birkeland currents. So to an outsider at least, all the leads one needs to follow up matters of climate are nicely in place. But oddly heretical to the quakademia. It ought to have been simple. Find the people who can DO THE JOB. Start taking them seriously. That would at least give you some pretty good leads to get at a more comprehensive theory. Here comes the “ocean acidification” scam, watch out! It’s really not surprising that the oceans (water occupies about 2/3 of the eaths surface area) have a major role in the earths climate. The oceans (water) is a huge heat sink (also a CO2 sink) which reacts together with cosmological activity (mainly the sun) to create stability in the earths climate. This in itself should be enough to discredit the idea that mankinds activities are significant in climate change. no – I don’ think any of the world’s climate scientists would be surprised. It seems however that you were surprised, but have realised it’s not really surprising. That suggests to me you don;t really know much about the climate. So put your deep knowledge to work — let us know: Where are the theories of this “well-understood” system that show any predictive skill at predicting el Nino/la Ninas, climate change, etc? Perhaps your old department is keeping them secret? Make no mistake: Demonstrated predictive skill is the only valid test of a theory. Conversely, lack of predictive skill proves a theory wrong. (A theory that claims to be able to predict the climate 100 years into the future, but is wrong at 5, 10, 15 years is wrong, period.) Only fools like you would risk the world’s economy on theories that are not only unvalidated, but so discredited by measurements that they require fraud to maintain any pretense of validity. Well, that’s not quite right: Politicians who would increase their power regardless of the consequences would take such risks — and they depend on fools like you to support them. There are three factors that also need consideratrion. 1) The deep ocean currents are driven by small density differences and are very slow. The timescale for change is centuries, not decades. The ENSO cycles is driven by atmospheric effects which its why it acts over decades. 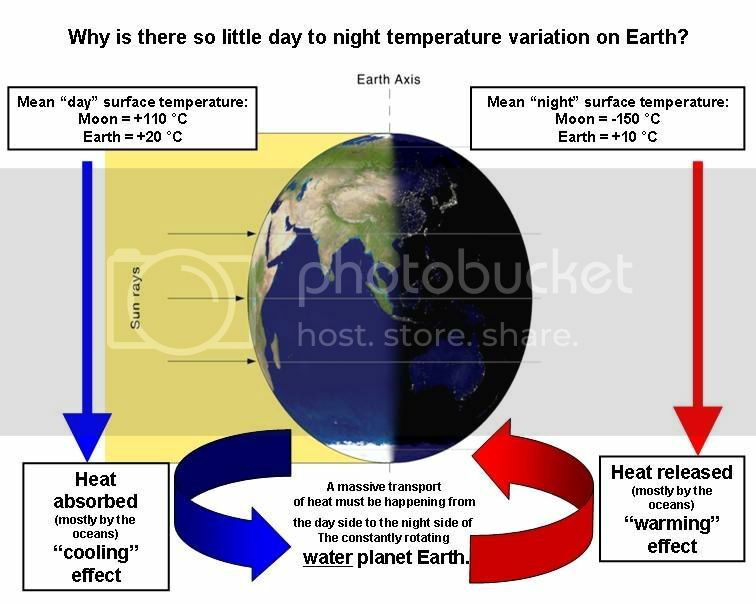 2) During an El Nino event the globe cools because it is ‘warmer’ than is justified by the amount of incoming energy. During a La Nina event it warms because it is cooler than justified by the amount of energy recieved. ENSO events are transient imbalances in the energy balance, they can only cause a trend in temperature if one mode outnumbers the other. 3)The best way to measure the total energy content change of the oceans is NOT to try and take the temperature of ALL the ocean and sum/average it. Just measure the volume change from thermal expansion. Where is the date of this posting please? It should be right at the top of the piece. I suggest. For every item published on this website. Extraordinary that I am having to ask you this!! Where is the date of this posting please?